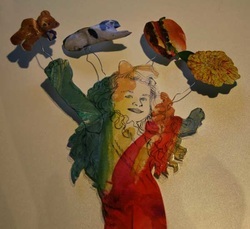 The Junior Art Workshop is the Pearl's after-school art class for kids ages 8-12. The workshop series includes 6 classes and all of the supplies needed to complete the art projects. Session One classes begin February 15, 2016 and meet on Mondays from 4:30-5:45pm through March 28, 2016 (except March 14 ). Session Two classes begin April 4, 2016 and meet on Mondays from 4:30-5:45pm through May 9, 2016. Space is limited to 16 participants. Although the portrait portion of our exhibition shows people from a bygone era we should remember that when those paintings were made, people dressed in the contemporary fashion of their time. The portraits created during this project will use watercolor as the medium but also incorporate some more timely materials in a fun combination. 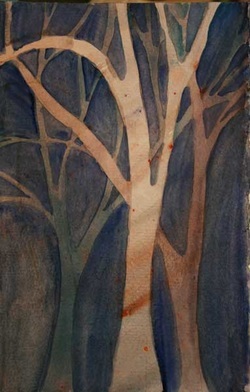 Resists are one of the many techniques that make watercolor a flexible and fun medium for all artists. We will explore some familiar and maybe unfamiliar ways to use this technique in their original artwork. We see atmospheric perspective in the current exhibit’s landscapes. This project aims to add to the students’ understanding about how to portray that optical illusion in paint. 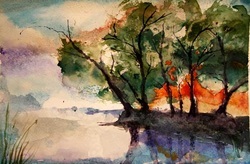 We will use all the things we learned in the previous lessons to create scenes of trees and water reflections that head more toward realism. The earlier lessons in our series helped the students gain experience in techniques and concepts we will put to use creating these ‘portraits’. Each animal will be portrayed by using elements of its natural habitat to create the coloring seen through a matt shaped like an animal’s silhouette. Sharing art is always fun. 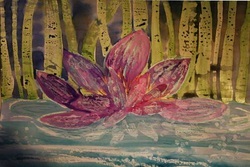 In this session-long project the artists will use several watercolor techniques to create unique leaves. Some they will keep but others they will trade with their class members like artists’ trading cards. By the end of our session we will finish up by making them into a keepsake sampler for each person to take home. Space is limited to 16 participants per session. Registration and tuition payment can be made online (see below), in person at the museum front desk, or by calling 281-376-6322. Please note: Registration is not considered complete until both the registration form and payment are received.